This will be the easiest recipe I have ever posted!! Just TWO ingredients!! Yes, you read that right..TWO!! Nestles Toll House Cookie tub and either 1 lb of bacon that YOU cook, or 2 c of Kirkland Bacon Crumbles from Costco…for me, I mixed BOTH!! Drain bacon and then chop finely OR use your bacon crumbles…your choice. Put in little bowl and take a TBL of cookie dough and “roll” it in the bacon and then put on cookie sheet. Fill the sheet and put in oven for 12-15 mins depending on how you like your cookies! I like mine “crispy”!! Could this be any easier?? No measuring, no fuss, and little mess!! It may sound like a weird combination, but it IS DEEDEEDEELICIOUS!!!! You have to try it!!! Let’s start with the #1 ingredient..a tub of Toll House cookie dough!! 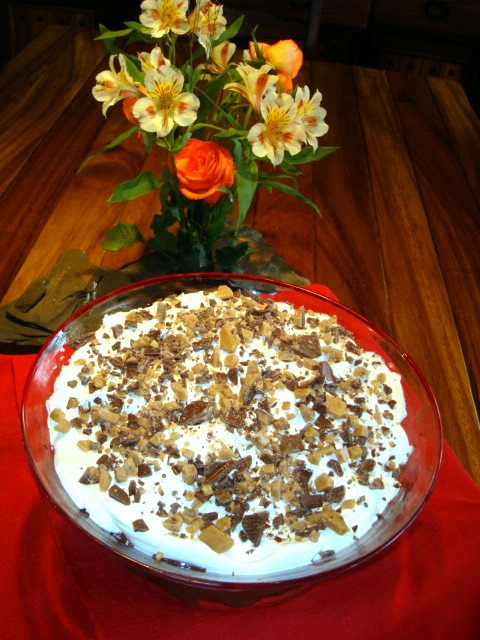 Chocolate “No Trouble” Cake or Parfait! 1 box Duncan Hines chocolate cake mix and make the cake according to the recipe on the back! 1 pkg of Heath Bars (6 bars) and put in freezer until ready to use or pkgs that are already crumbled “new” in the store!! * Take Heath Bars out of freezer, smash with hammer then open and put into bowl or buy that ones that are already smashed! * Now, take the broken up pieces of cake and make a layer, then top with ½ of the pudding mixture and spread over the cake. Then add half the cool whip and continue to make another layer. Finally, top with ½ of the Heath Bar and do it again starting with the broken cake so that you will form another 3 layers then Heath Bar topping. * Chill until ready to serve! 2. Gather & Measure ALL your ingredients and then put in separate bowls and put aside. Beat the eggs and put aside. 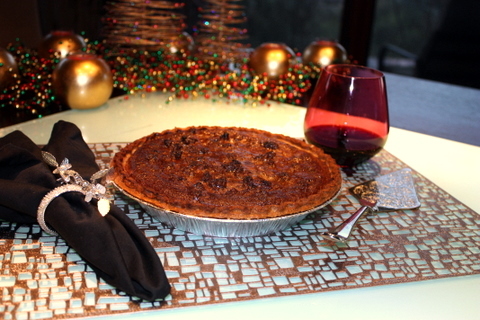 Have your pie shell ready to go…and NOW, let’s get started!!! 3. Put chocolate chips into bowl and microwave for 1 minute. Take out and stir. Then add chopped pecans to chocolate chips and stir until mixed. 4. Now take that mixture and cover the bottom of the pie shell. 5. In a separate mixing bowl, whisk the remaining ingredients together and then pour on top of the pecan/chocolate layer. 6. Put into preheated oven and cook for about 50-60 minutes. *** If using a convection oven cooking time may be cut in half**** be sure NOT TO BURN!! Bake until filling sets. *** A nice whipped cream or caramel sauce would be great on top….or just have it all by its lonesome!!!! !